MOBA Introduces Multi Outlet Innovation to Reduce Contamination. 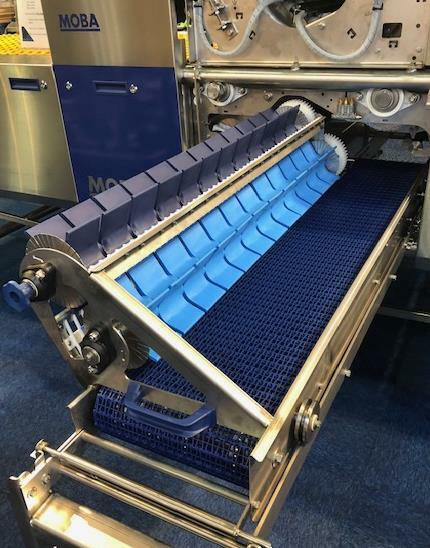 At the 2019 IPPE, MOBA a leading producer of integrated grading, packaging and processing equipment announced the launch of Multi Outlet. This new system will optimize product flow and lower the risk of cross-contamination. Multi Outlet removes leakers and dirty eggs in the Multi drum before unsoiled eggs pass to the next roller section. This ensures that dirty eggs are removed as early in the process as possible. These eggs are returned to be re-washed by means of a conveyor leading back to the accumulator. The eggs follow a short loop, even with high-capacity machines, and the movement of leaking and dirty eggs is confined to a limited area of the installation. Product flow is optimized and the risk of cross contamination is significantly reduced. Eggs from the egg washer are transported on a separate roller section and are subjected to automated camera inspection. Each egg is checked for leaks and dirt. Leakers are rejected before they can come into contact with any other surface and are dropped into a bin and exit from the machine. Some machines are equipped with either an automated auger or pump system to collect soiled eggs. Dirty eggs are removed by plastic flaps that have a gentle action. Unlike brushes, flaps that catch eggs, have a hygienic and easy-to-clean surface without crevices allowing bacteria to multiply. Dirty eggs are transferred to a conveyor that can be connected to a re-wash return conveyor. Clean eggs are then oriented with correct point setting for transfer to a dry roller section. Eggs are then transported to the downstream egg dryer, UV disinfection unit, crack detection unit and the grader. At the end of the production shift, the whole section can be cleaned with a high-pressure water spray. An automated CIP system can also be used to clean and disinfect the two roller sections. The Multi Outlet system is now available on PX700 machines.